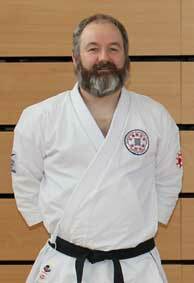 About: Alexander (Ally) Whytock is a 5th Dan black belt and has trained in Shotokan since 1983. Ally has gained success in competition at the national level. Ally was born and brought up in Coupar Angus. I began as a Karate learner in 1983, started teaching Karate in 2009 and established my own club in 2011. I quickly decided to bring a more professional approach to my coaching method or Karate pedagogy. Having been a student of the “old school” training I knew that I needed to understand what it was to be a learner within a more contemporary or scientific learning approach. To my surprise I found more commonality with the new and old ways. Throughout this article I make references to sources from which I had serendipitous resonation with my own experiences. I had experience of contemporary learning having been a science/engineering based academic student. From the academic world, I discovered that preparation was essential. During my first year of academia I realised that I had to be organised to cope with the amount of work and get a balance between academia and a social life. I would create a 12-week revision plan prior to the examinations, in which I would repeat revising of each topic at least four times. These regular repeats would turn short term memory to long term memory and it worked. From the martial arts world I was first inspired by W.E. Fairbairn in which he mentions that movements should be instinctive, automatic and practiced daily. (Fairbairn, 1942). No surprises there, considering the military tactic to plan, practice and revise. So, armed with some experience of learning correctly and limited experience on how to coach I embarked on teaching Karate. I quickly realised that the best way to learn how to teach was to learn from one’s mistakes yet making too many mistakes can be fatal to a fledgling club. As a learner of Karate, a student follows a study process involving the incremental and iterative acquisition, practicing and training of skills. Note the terms incremental and iterative are now commonly used in the engineering world and is referred to as being Agile. A learner will appropriate new skills or simply put - learn a technique. This involves watching the coach demonstrate a technique and listening to the coach’s description. The learner will begin slowly, breaking the technique down into component parts and then building these component parts together into a fluid and controlled movement. The coach will observe and inform the learner of corrections by giving precise and lucid instruction. As the learner repeats the technique slowly, they will subconsciously begin to learn the movement, in which the brain will begin to form connections and provide subconscious control through recognition of a repeating pattern. This phase is primarily done in class; yet as technique is learned which includes the difference between a correct and an incorrect technique, then the learner will take this lesson out with the class and must practice the technique between classes i.e. at home. As Patrick McCarthy explains “your progress is proportionately equal to your effort. The more you practice the faster you progress - the faster you progress the better your skills.” (McCarthy, 2015). As the learner practices what they have learned, they will refine the technique whilst also learning how their body reacts or responds to the technique. The practice should be “Deliberate” as described by (K. Anders Ericsson, 2018) in which he and his co-authors conclude “the differences between expert performers and normal adults reflect a life-long period of deliberate effort to improve performance in a specific domain.” The learner focuses on correct technique through extended periods of effort dedicated to repeat performance patterns in which practice does not stop when the technique is done correctly but extended into periods of when the technique is not performed incorrectly. In fact, one could succinctly summarise Deliberate Practice using topics from Dojo Kun, Funakoshi’s Six Rules (Funakoshi, Karate-Do: My Way of Life, (29 Mar. 2013)) or the Twenty Precepts (Funakoshi & Takagi, (29 Mar. 2013)). So, even with contemporary or science-based training, the fundamentals were identified and documented in the late 19th and early 20th century. Unfortunately, many teachers neglected to consider how to apply these effectively and appropriately. Many opted for an uncompromising and harsh regime of negative motivation. Fundamentally, as the learner begins to recognize improving ability then there will be a corresponding increment in confidence and motivation. With motivation comes the need to train. This leads to the next learning sequence - training. This should not be looked upon as an end to the learning but rather a deeper study as the use of the technique is applied to different scenarios or adapted to different environments. This normally comes as part of inclusion within a series of other techniques that flow into combinations and applications. As the technique is trained, as this author would humbly express as “Deliberate Training”, the technique becomes a more natural skill and forms a basic foundation on which further techniques can be built. This is achieved through the brain making connections to that which has already been learned, when appropriating new skills. As Ericcson and Pool state (Ericsson & Pool, 2016) on Page 204 “the best … didn’t achieve their heights by imitating their teachers…the most important lesson they gleaned from their teacher is their ability to improve on their own”. This resonated with my personal experience that my priority is to make my students better than myself. There has been too much adoration of ancestral teachers and unwillingness to deviate from the dogma. I wanted to change this. For the coach the most critical time is the initial learning phase. If the technique is not taught correctly then the skill will never be developed properly. Demonstration of correct technique is a fundamental requirement with explanation of large motor skills at first, with a hierarchy of explanations during the breakdown of the technique into component parts. How the instruction is given and how feedback of correct or incorrect techniques is given to the learner are critical. As with learning other subjects, instruction & feedback must be given in a positive and realistic attitude to build confidence and motivation whilst not building a false sense of ability, which in the self-protection area of Karate, can prove to have tragic outcomes during real world encounters. Language is a critical coaching aspect and the wrong, flippant or inappropriate comment can make the difference between a motivated and a demotivated student. In his book Dr Dave Alred MBE (Alred, 2016) discusses the importance of language and how it can make a difference in the whole learning process and performance of skills. Page 253 to 258 concludes his excellent book on the whole subject of learning and dealing with pressure. He also describes a soccer incident in which a player loses the ball to an opponent, runs the full length of the pitch to recover the ball and save a potential scoring attempt. The manager barked the player down for losing the ball and never mentioned the tremendous effort to recover the situation. Having been a Karate student from the 80’s to the early 00’s I experienced a lot of external discipline and motivation. However, at some point the coach has to take a step back to allow the learner to build internal discipline and internal motivation. External discipline and motivation, taught by example, by the coach leading by example, will encourage the learner of the correct approach to learning and then practice. Practice is a solo endeavour by the learner yet progress is checked by the coach during the next phase – Practice. The role of the coach during the practice phase is to confirm correct technique and to provide feedback of improvements. The coach must encourage the learner during this phase and provide examples of “do” and “don’ts”. Yet the onus is on the learner to practice. During this phase the learner will begin to build an internal discipline and motivation. Without these then practice will become weak and the acceptance of incorrect technique will build bad habits, which will be very difficult to erase. With the correct internal discipline and motivation, the practice becomes more intense and the desire to train becomes great. This leads to the next phase – Training. The role of the coach during Training is twofold. Again, feedback, done with the correct attitude, is given. The coach will also provide themselves as a training partner or will provide partners to help the learner to develop the skill for adaption into different scenarios and environments i.e. further developing a kick for different heights or inclusion into a longer sequence or combination. The coach will further suggest any additional training methodologies to assist further development of the technique or skill e.g. cross training and/or conditioning. Finally, the coach should be a good listener, as the training becomes more intense then the learner will experience many peaks and troughs, injuries or well being issues. As training begins to become more elite level then the dislike of the “Deliberate Training” by the learner will increase. By listening the coach will allow the learner to offload negativity or concerns, however, the coach should then advise and guide a strategy to help, motivate or set the learner back on the right path. It should be recognised that the coach or teacher would have experienced similar peaks and troughs and through this experience will be able to guide the learner. As the Japanese term for a Karate Teacher is Sensei, there is a reason why this is regularly translated as “one who has gone before” – a title that should not be self-appointed but rather a reference used by the learner. To summarise my own method and the welding of old and new, I decided to create Five Ways to Improve. These ways are a connection of Sixth Sigma, a common approach to engineering quality control and statements from Martial Arts. Sort [Seiri] - Leave only that which is absolutely necessary. Samurai Miyamoto Musashi said in his Book of Five Rings "Do nothing that is of no use". Don't add anything to the karate techniques. Keep it simple as instructed and don't embellish techniques with wasteful movement. Set in order [Seiton] - There is a place for everything and everything should be in its place. In terms of context - don't use competition sparring for self-protection - and vice versa. Shine [Seiso] - Keep everything in top condition. Keep it clean. Train continually & remember Shotokan Precept #11: Karate is like boiling water: without heat it returns to a tepid state. Standardize [Seiketsu] - Training should be consistently a high standard. Shotokan Dojo Kun #1 - Strive for perfection - not only of technique but also of good character. Remember Shotokan Precept #18 Perform Kata exactly; actual combat is another matter. Funakoshi’s Rule #1: You must be deadly serious in training. When I say that, I do not mean that you should be reasonably diligent or moderately in earnest, I mean that your assailant must always be present in your mind, whether you sit or stand or walk or raise your arms. Should you in combat strike a karate blow, you must have no doubt whatsoever that that one blow decides everything. If you have made an error, you will be the one who falls. You must always be prepared for such an eventuality. You may train for a long, long time, but if you merely move your hands and feet and jump up and down like a puppet, learning karate is not very different from learning to dance. Sustain [Shitsuke] - Continually review your karate and ensure the foundations, the roots, of your karate are sure and strong. Funakoshi's Rule #5: Try to see yourself as you truly are and try to adopt what is meritorious in the work of others. Modern training methods can be applied to ancient disciplines and the result is a more rounded, motivated, enthused and able Karate student or Karate Ka. There is also good advice to be found in the old ways which resonate with the contemporary methods. To such the approach of Shuhari [see https://en.wikipedia.org/wiki/Shuhari] is applicable. Alred, D. D. (2016). The Pressue Principle. Penguin Life. Ericsson, A., & Pool, R. (2016). Peak Secrets from the New Science of Expertise. The Bodley Head. Fairbairn, W. (1942). All-In Fighting. The Naval & Military Press. Funakoshi, G. ((29 Mar. 2013)). Karate-Do: My Way of Life. Kodansha America, Inc; Reprint edition. Funakoshi, G., & Takagi, J. ((29 Mar. 2013)). The Twenty Guiding Principles of Karate: The Spiritual Legacy of the Master. Kodansha America, Inc.